When it comes to a focus on sustainability, Ulikett is on the pace! 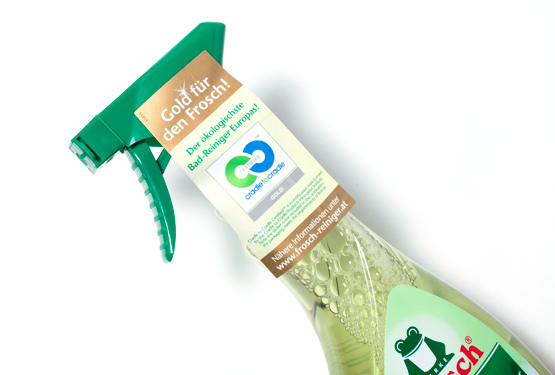 The Siegwerk company has developed sustainable printing inks for the Frosch Citrus bathroom cleaning agents and the Viennese printing house, Ulikett, applies them to the product labels. This is sustainability cooperation at its best. In the course of the Werner & Mertz recyclate initiative, the next successful step forward has been taken with regard to sustainability. Following bottles made from recycling material (for Frosch products), the printing inks are now being manufactured in line with the Cradle-to-Cradle® principle, which has been developed by the leading ink producer Siegwerk. The Ulikett printing experts are now applying the sustainable inks to the Frosch labels in Vienna. The first edition of several thousand labels was subjected to intensive testing and the results were so positive that the products with the sustainable labels are already on the shelves of retail outlets. This means that at a stroke Ulikett achieved something that would have been beyond many printing houses. The Environmental Protection Encouragement Agency (EPEA), describes Cradle-to-Cradle® as a concept that is based on a natural model and stands for innovation, quality and good product design. The prime concern is the safe and potentially endless circulation of materials and foodstuffs in loops. Consequently, production, utilisation and reuse are all included in the evaluation of the product. In addition, EPEA ensures that continuous product optimisation processes are in place, which prepare the ground for improved compatibility between humankind and nature.